The general of the Fire-fury Army of the "Big Death-Stars". 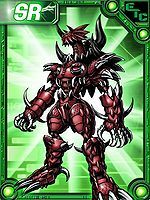 It leads a multitude of dragon Digimon in perfect order, and destroys its enemies with its overwhelming battle strength, in any kind of combat situation. It excels in both power and speed, and with its wealth of combat experience its powers of intuition is outstanding, so that it can easily handle battles where it must adapt to the moment. Due to a personality that prefers the flames of destruction surging across the battlefield, it stirs up battles when it comes across a peaceful area. And although it's a Digimon, it obtains pleasure from gazing on the sight of the world being incinerated. 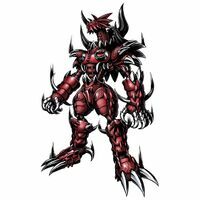 Its "Tyrant Collbrande", which uses the anger it works up in battle as a flaming sword, demonstrates its powerful depending on the might of its rage. It unfolds in battle that it is a match for one thousand warriors, as it modifies the terrain and inflicts damage on groups of enemies with its "Burning the Dragon", in which it stabs a dragon's vein within the land, and instantly reduces anything touched by its ultra-high-temperature "Dragon Breastonic Fire" to ashes. The general of the Fire-dragon Army of the "Big Death-Stars". It leads a multitude of dragon Digimon in perfect order, and destroys its enemies with its overwhelming battle strength, in any kind of combat situation. It excels in both power and speed, and with its wealth of combat experience its powers of intuition is outstanding, so that it can easily handle battles where it must adapt to the moment. Due to a personality that prefers the flames of destruction surging across the battlefield, it stirs up battles when it comes across a peaceful area. And although it's a Digimon, it obtains pleasure from gazing on the sight of the world being incinerated. Its "Tyrant Collbrande", which uses the anger it works up in battle as a flaming sword, demonstrates its powerful depending on the might of its rage. It unfolds in battle that it is a match for one thousand warriors, as it modifies the terrain and inflicts damage on groups of enemies with its "Burning the Dragon", in which it stabs a dragon's vein within the land, and instantly reduces anything touched by its ultra-high-temperature "Dragon Breath Tonic Fire" to ashes. 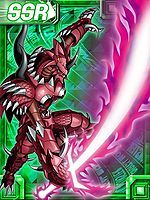 The Fire-fury Death General that rules Dragon Land! It leads a multitude of dragon Digimon in perfect order, and destroys its enemies. Due to a personality that prefers the flames of destruction surging across the battlefield, it stirs up battles when it comes across a peaceful area. 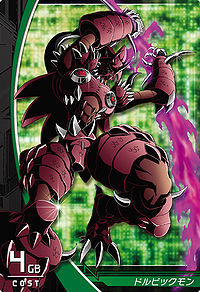 And although it's a Digimon, it obtains pleasure from gazing on the sight of the world being incinerated. Its Special Moves are things like using the anger it works up in battle as a flaming sword (Tyrant Collbrande). Title: 「火烈将軍」 — "Fire-fury General"
Possibly a corruption of Dornick, an American English term meaning "pebble, stone or small boulder", which is at the same times a derivation from the ancient Irish "dornóg" (small stone), as a reference to the mythical "Sword in the Stone". Also, "Dorubikku" is a play on the portmanteau from its Signature Movement "Dragon Breath Tonic" (「ドラゴンブレストニック」 Doragon Buresu Tonikku). Dorbickmon's design is based on the mythological Welsh Dragon. Transforms its anger into a flaming sword and attacks with it. Stabs a dragon's vein within the land to modify the terrain and attack enemies. Dragon Breath Tonic Fire  ドラゴンブレストニックファイア Doragon Buresu Tonikku Faia Dragon Infernal Fire Fires streams of flame from symbols on its chest. Dorbickmon is one of the seven Death Generals, ruling over Dragon Land. Dorbickmon appears in one of the omakes. Dorbickmon can only be obtained as a collectible card. Its card is part of the Big Death-Stars (ビッグデスターズ Biggu Desutāzu) set. Dorbickmon is an unobtainable Boss Digimon. The general in charge of the Fire-fury Army. It leads the Dragon Digimon, and fights with its wealth of battle experience. It enjoys instigating battles in peaceful areas, using its overwhelming battle force to bring forth the flames of destruction. ↑ Digimon Xros Wars: "For the Future of the Digital World! The Friendship with the Death Generals!" This page was last modified on 1 April 2019, at 14:22.